Preschool QuickSource® reminds us that "SCIENCE is the study of the world and how it works. Children are natural scientists and their curiosity leads them to seek answers to questions and make connections. By experimenting, making predictions, exploring, testing observations, and investigating, children learn about the world they live in." Here's an activity called Hand and Toe Pictures. The goal of this activity is recognizing individual body parts. 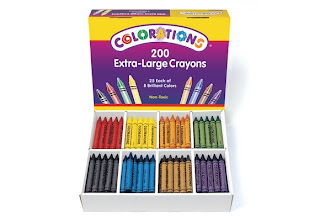 Before you begin gather your materials: large art paper, washable finger or tempera paint, paint brushes, crayons, markers. For cleanup: soap & water, paper towels. 1) Paint the hands and feet of each child. 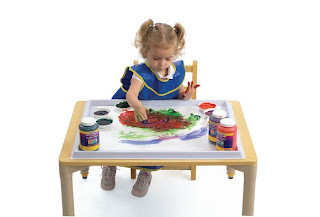 Have the child make a paint imprint on the large art paper with each body part that is painted. (Optional: This activity can be simplified by using only one hand and one foot.). Allow the child to decide where to make the imprints on the paper. 2) Help the children thoroughly wash their hands and feet after making the imprints. 3) Allow the art prints to thoroughly dry. 4) Give each child his/her art print. Using crayons or markers have each child create a picture out of the prints they have made with hands and feet. If using POCET™, this activity correlates to Developmental Guidelines: SC3: Recognizes Individual Body Parts. Kindergarten QuickSource® reminds us that "Language is all around us, and nothing supports a child's language skills like early experiences with speaking and listening. By engaging children in conversations, exposing them to new words, singing songs, discussing symbols and their meanings and encouraging expression of thoughts, feelings, and opinions through words, you lay the foundation for a child's later communication and reading success." 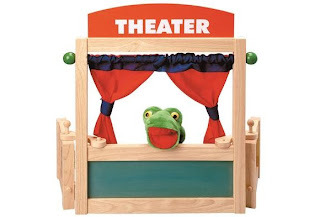 Here's an activity called Telling a Story with Puppets that encourages children to use complete and more complex sentences as well as to listen attentively to their fellow classmates. This activity doesn't require many materials: puppets and story suggestions. Be sure you have several story suggestions for the chilren before starting this activity. 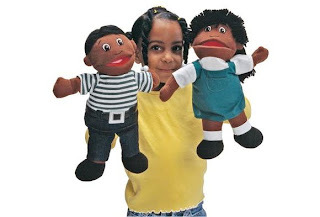 1) Give the child an opportunity to create a story using puppets. When children can pretend to be someone else, they often concentrate on using complete sentences and creating a verbal structure. 2) To lessen the pressure, it is sometimes better for the child to have just one additional child listening to the story. 3) You may need to offer suggestions to help the child begin the story. 4) Another option is to have a pair of children work as partners in tell a story. Each child can be a different character in the story. If using POCET™, this activity correlates to Developmental Guidelines: LG5: Expresses Ideas and Responds to Questions with Complete Sentences and More Complex Vocabulary. For more developmentally-appropriate activities, visit Teacher QuickSource® and browse through all age areas, including Preschool, Kindergarten, Infant & Toddler, and Head Start. Don't forget to explore activities promoting environmental awareness at Environmental QuickSource®, too!